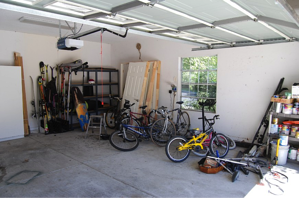 Is your garage a mess? Are you ready to tackle the clutter? If you want an organized garage, you might be considering recruiting the help of a professional garage organization company. How can you tell if the project is something you can handle yourself or if you should leave it to the pros? What’s your reaction when you pull into the garage every day? Do you feel a calm sense of home or does the mess in the garage make you angry? The garage is so often a source of embarrassment, a room you run through with your eyes closed to avoid seeing the clutter. It’s one of the few places in your home where you store the I-might-need-this-someday junk. However, when the clutter starts impacting your quality of life, it’s time to put reorganization at the top of your to-do list. Most garages today are so crammed full of clutter that the cars lose out on a place to park. Parking in the driveway is acceptable – until the weather makes you dread going out to start your car. You don’t plan for it to happen of course, but with all the odds and ends packed into the garage, your two-car garage may have become a no-car garage. If so, it’s time to contact a professional. The garage is arguably the most difficult room to get organized and keep organized. The reason you’re struggling to sort clutter in the garage isn’t because you can’t do it; it’s because you feel overwhelmed by the task at hand. If you don’t know where to start, a professional can provide the solutions you’re pining for. You can transform the look of your garage by not only organizing it, but by adding a decorative floor coating as well. Epoxy concrete coatings or garage floor tile installation is best handled by a professional. Maybe you want to do more than just organize. Maybe you want to make the garage more functional by adding an industrial sink, floor-to-ceiling cabinetry or workbench area. You can work with a professional to map out such tasks and bring your vision to life. By leaving custom garage organization to a professional, you make the most of this highly neglected space without going crazy in the process! It’s a win-win situation you shouldn’t pass up.